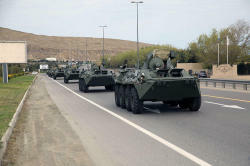 Russia has delivered another batch of ammunition and modern military equipment for various purposes to Azerbaijan on April 26. The defense ministry reported that the equipment and ammunition were delivered in accordance with an agreement on military-technical cooperation signed between Azerbaijan and Russia. The new military products, delivered by ships from Russia and accepted with the participation of experts, will be transferred to the appropriate military units. The acceptance of purchased new sets of ammunition and military equipment into the armament of the military units of Azerbaijan Armed Forces, as well as their full readiness for combat use will be ensured in the shortest possible time, the ministry said. Training of military personnel , who will operate and use new weapons and military equipment is conducted by Russian instructors. 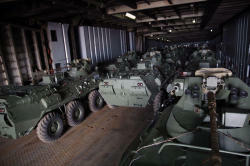 Furthermore, a phased modernization of the used weapons and equipment is carried out with the use of the latest technology. 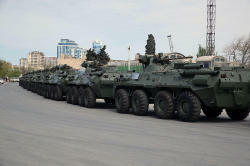 The Azerbaijani Army, which today is considered the most modern army in the Caucasus, consists of Air Force and Air Defense Forces, the Navy, and the Land Forces.